Volunteers from all over Russia are working in the Vologda Region to save a unique monument of 18th-century architecture – the Church of the Nativity in the village of Krokhino – from destruction. For 50 years, it has been surrounded by water after the village was flooded during the construction of the Volga-Baltic Canal in 1964.
n ancient Russian legend tells of the invisible city of Kitezh, which sank beneath the waters of Lake Svetloyar in central Russia when Mongol invaders approached it in the 13th century, never to be seen again. Seven hundred years later, in the 20th century, the fate of the mythical city of Kitezh became a tragic reality for hundreds of villages in Russia, when after World War II a massive artificial widening and deepening of the country’s rivers began – for the passage of large vessels or construction of hydropower plants. Entire villages and small towns became flooded and thousands of people were forced to abandon their houses. 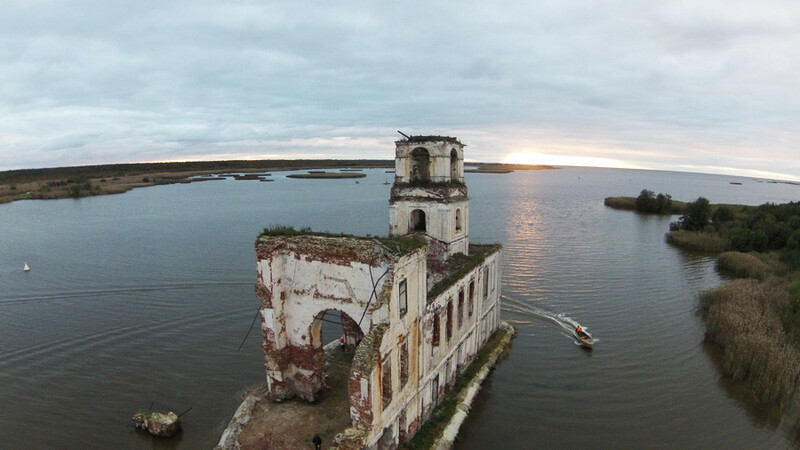 The most famous example is Kalyazin, in the Tver Region north of Moscow, where today a lonely bell tower in the middle of a lake is all that is left of the old town, submerged during the construction of the Uglich Hydroelectric Station in 1940. Volunteers are working to restore the building. A quarter of a century later, the same fate was to befall the village of Krokhino, located on the banks of the Sheksna River in the Vologda Region, 400 miles north of Moscow. For centuries here there were noisy fairs, fish and grain were sold, boats were built, and every day the bells of the Church of the Nativity summoned the villagers to prayer. After the establishment of the Soviet regime, the church was not destroyed, but was turned first into the village club, then a workshop and finally into a drying house for grain. But in 1964, during the construction of the deep-water Volga-Baltic Canal, the water level in the Sheksna River was artificially raised – and the village was submerged by the lake, leaving only the white-stone church rising out of the water. With the passage of time, the ancient stone structure, whose bell tower was used as a beacon for passing ships, began to sink in the wet soil, while the walls began to crumble from the waves of passing vessels. 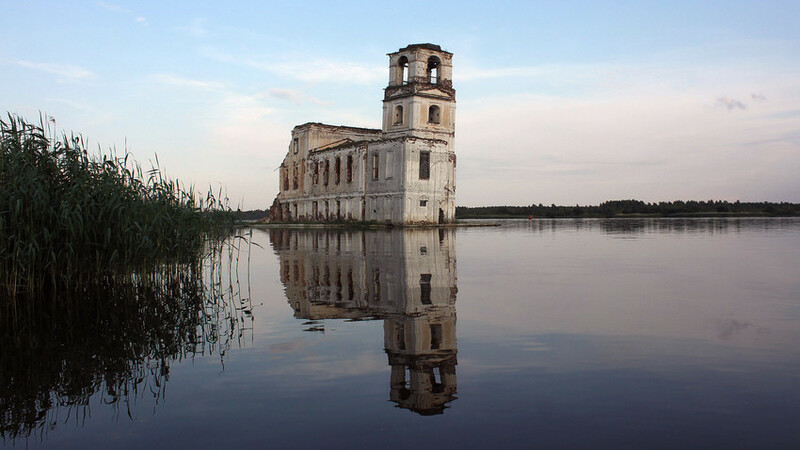 But the fate of the marooned church was to change one day in 2009, when Muscovite Anor Tukayeva happened to come in her car to the shores of the Sheksna reservoir. Six years earlier, Tukayeva was working as an expert in the field of state and municipal government. One day she saw a documentary about the construction of the Volga-Baltic Canal and was fascinated by this little-known page of history. She definitely decided to see the legendary church with her own eyes. “Once in Krokhino, I realized how easily we could lose this defenseless architectural creation for good,” she said. Tukayeva wrote letters to government agencies but did not find any support. However, like-minded people gradually started gathering around her, eventually resulting in the formation of the Krokhino charity project. 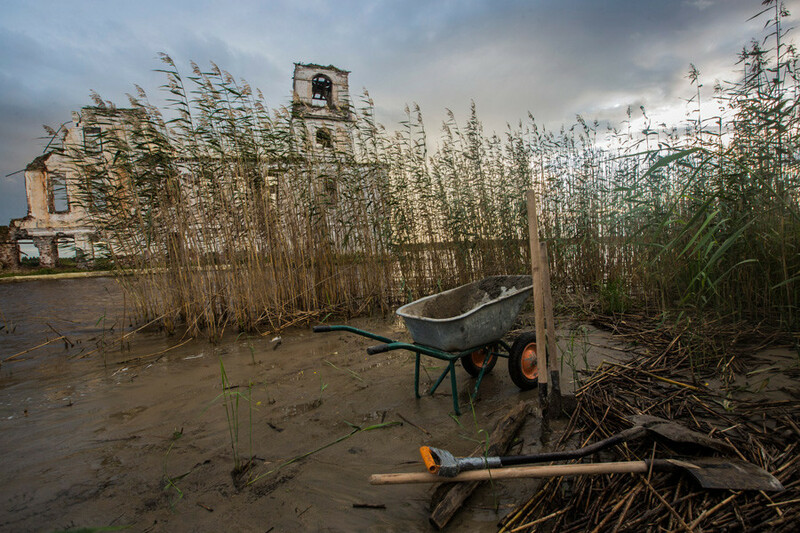 Tukayeva took the first group of volunteers to the drowned village in 2011. To get close to the church was only possible by boat or speedboat. Once on the island, the volunteers first began to dismantle the rubble. From the wreckage of the walls, they built a dam. They restored the stonework of the undermined walls, underpinned the shallow boulder foundation under it, erected a buttress to strengthen the northern wall of the porch and fixed the broken beams of the bell tower. Then they started laying a path to the church across the swamps. “My husband initially thought that my passion would soon pass. But then he realized that this was serious. He got a captain's license and now helps the volunteers to go to the temple by boat,” said Tukayeva. Volunteer shifts are held eight times a season. A volunteer's day in Krokhino begins almost at dawn. After an early breakfast, the volunteers, aged from 16 to 72, depart to the island, where work is in full swing until sunset. “We put broken bricks in the bags – these are to strengthen the dam. We set whole ones aside – for the restoration of stonework,” explains Yana Safronova, a German teacher who came to Krokhino from Moscow. Safronova labors alongside her friend Tatyana Zaitseva, a teacher at a children’s architectural and art school. Zaitseva is busy strengthening stonework with other volunteers. This is not an easy task, as mortar dries quickly and needs to be applied to the places where the stonework has crumbled before it solidifies. This is not yet restoration, but primary emergency response work. The main thing for the time being is to preserve the structure and not to let it decay from water and wind. Until recently, the project was carried out by volunteers on their own, without any outside help and with minimal financial support. “But now we must rise to the level of professional engineering work – so we have launched a crowdfunding campaign,” said Tukayeva. 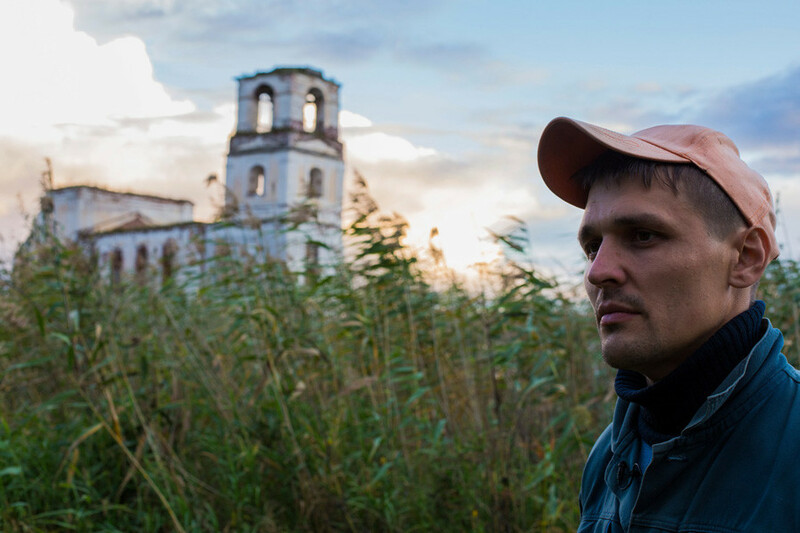 A series of videos in support of the revival of the church in Krokhino featuring well-known Russian actors and TV presenters has been launched on the project's Facebook page. It is unlikely that the Church of the Nativity in Krokhino will be able to gather believers within its walls again any time soon. But it will certainly be more than a sight; it will be a monument to all the Kitezhes of the 20th century that have vanished under the water.